These protected areas and nature reserves in Saudi Arabia provide safe havens for the country's native flora and fauna. Nubian Ibexes in the Ibex Reserve Protected Area south of Riyadh. These protected areas and nature reserves in Saudi Arabia provide safe havens for the country's native flora and fauna. For a country so dry and whose vegetation has been completely degraded by livestock grazing, creating protected areas and nature reserves provides the natural vegetation a chance to recover and grow. For example, the Mahazat as-Sayd Protected Area is the second largest completely fenced reserved region after Kruger Park of South Africa. Uruq Bani Ma'arid allows for controlled grazing and hunting because its flora and fauna are still in recovery. Other protected areas in Saudi Arabia include Ibex Reserve Protected Area and Wadi Turabah Nature Reserve. The Uruq Bani Ma'arid protected area lies along the western side of Rub’al Khali, the world’s largest expanse of sand desert. The area comprises of three sections of nature area at the center, a buffer zone where controlled grazing takes place, and a hunting area. In total, the national park covers at total area of around 4,887 square miles. The reserve lies on a limestone plateau and also includes wadis, gravel plains, and the Tuwaiq Escarpment. Uruq Bani Ma'arid experiences a hot and arid climate. Rainfall usually amounts to about 30 millimeters per year. Uruq Bani Ma’arid serves as an important Plant Area for its richness in plant life, many of which are indigenous to the Arabian Peninsula. Plant species like Acacia, grasses, and some perennial legumes grow on the escarpments and some small plants like the Calligonum crinitum ssp. Arabicum, perennial grasses, and sedges grow on the dunes. Animal species in the park include the reintroduced species of Arabian Oryx, Arabian sand gazelle, and the mountain gazelle. Others include the red fox, Cape hare, sand cat, desert hedgehog, Lesser Egyptian Jerboa, and Cheesman’s gerbil. The Ibex Reserve Protected Area is near the town of Hotat Bani Tamin and a small village called Al-Helwah. The park houses many types of desert animals which are on the verge of extinction from excessive hunting and drought. The park covers 915 square miles of the Tuwaiq escarpment. 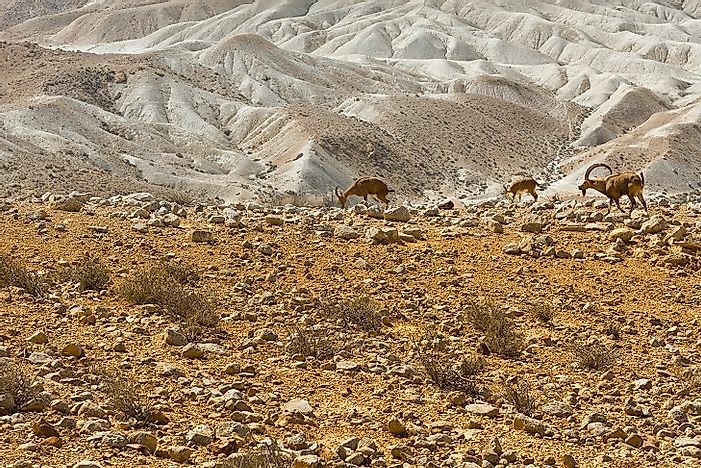 It has steep-walled wadis which offer ideal conditions for the preservation of the ibex and other wildlife like wild cats, eagles, rock hyrax, and mongoose. The Ibex reserve was established with the aim of creating a protected area for the Nubian Ibex. Plans are also underway to reintroduce gazelle. This reserve is need of dire protection. The Wadi Turabah Nature Reserve is in Makkah Region in Saudi Arabia and covers an area of around 156 square miles. It lies next to the Jaba Ibrahim, which is a granite mountain with an elevation of about 3,300 feet with rocky hills around it. Wadis sourcing from Jabil Ibrahim give Wadi Turabah a continual flow of water. The reserve has many base sheets of rock, mountain crags, boulder-covered slopes covered with vegetation, and areas of montane woodlands. Acacia woodlands are found in the lower elevations while Ziziphus and Ficus tree grown along the wadis. The hamadryas baboon, Arabian wolf, caracal, and the red fox constitute the land animals. There are also endemic fish species like Garra buettikeri, Barbus apoensis, and Cyprinion mahalensis. Wadi Turabah Nature Reserve also forms an important birding area with species such as Egyptian vulture, Philby’s Partridge, griffon vulture, Arabian Waxbill, Tristram’s Starling, Yemen thrush, and much more. The reserve provides the only breeding place for the hamerkop on the Arabian Peninsula. Located in central Saudi Arabia, the Mahazat as-Sayd Protected Area covers around 849 square miles. Grasslands dominate the reserve. The Arabian oryx, red-necked ostrich, houbra bustards, and rhim gazelle have been reintroduced in the reserve. This reserve used to provide a home to wolves and gazelles like idmi and Dorcas. Cheetahs and striped hyenas also used to inhabit the area. Today, the area has a 220-kilometer-long fence stretching all around it. This complete closure from livestock grazing has conferred protection to the natural vegetation allowing it to recover. Creating protected regions has facilitated the reintroduction of animal species whose populations had become threatened in Saudi Arabia, a country once filled with an abundance of native animals. Widespread hunting and uncontrolled grazing are still a threat to these dwindling populations. However, with strict conservation and protection, these animals have a chance of recovery and reestablishing once again.